I’ve mentioned the raw milk vending machine before, but it is so cool I think it deserves a post all to itself. Just to set the scene: I live in a small village across the river from Aosta, a 2000+ year old town nestled in the steepest part of the Alps. So, while I live within walking distance of a lovely ancient town, I also live in an apartment on a who-knows-how-many-centuries-old farm, surrounded by picturesque cow pastures. I forage for tasty wild things for dinner out in those fields, and sometimes chase my rabbit when she’s decided to go on a frolic. It’s a shame that I am such a horrible photographer, because it is breathtakingly beautiful. The neighboring farm, which is right across the field out (the one outside my kitchen, because there are fields on all sides), has the raw milk vending machine. This is the field I cross to get my raw milk. I even pass by a tiny vineyard! ‘Raw milk vending machine?! What’s that?’ you say? Well, it is exactly what it sounds like. It is a vending machine outside the barn that dispenses raw milk. 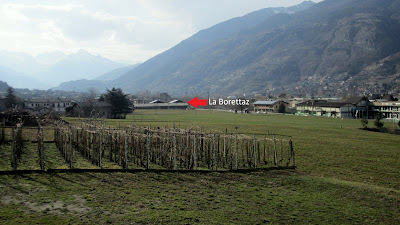 The farm is La Borettaz, and they make all kinds of lovely dairy products, including Fontina (real Fontina is only made in tiny Valle d’Aosta, so it is pretty special), brossa, ricotta, butter, and yogurt. When I stop and get milk, I often say hi to the friendly cows in their open barn. They have three vending machines outside the barn, open 24 hours a day. It is super fun to go on a midnight raw milk run. One vending machine is the raw milk machine, where they put vats of straight-from-the-cow milk. It’s pretty strong tasting…these days it is hard to find milk that actually has flavor. This milk usually has the slightly herbal tang of Fontina, and is delicious. There is a machine that sells milk bottles, and finally the machine that sells other dairy products. Ta -da! Raw milk with the push of a button. The cheese/yogurt/butter vending machine. It even gives back change. The other really cool thing about this place (besides the obvious fun of walking across a wildflower filled field with milk bottles in hand) is that they have the 2009 & 2010 QUEEN COW of the region, Cobra. ‘What the heck is a queen cow?’ you are probably wondering. The ‘battle of the queens’ is one of the most important sports of Valle d’Aosta. All year there are preliminary battles between the toughest cows of all the villages in the region, and then there is a final championship between the winners of all of the dozens of preliminaries. The championship is held in the Cow Dome. Yes, we actually have a stadium build specifically for this. There are three weight divisions, and the contestants are nearly all the short legged, dark brown mountain cows who produce the milk for Fontina cheese. They put two cows near each other, and then after munching some grass, pooping, and pawing the ground they usually start pressing their heads together. They push against each other until one cow decides they’ve had enough and then they run away. The remaining cow wins. The cows are required to be pregnant, so that they won’t hurt each other. It’s something that cows do all of the time in the fields to determine the pecking order, so I don’t really feel bad about watching them do the same thing I see every day, but in a stadium. Anyways, La Borettaz are the proud owners of Cobra, who won the ‘Battle of the Queens’ two years in a row! And I can say that I drink the raw milk of a champion. Glaciers and Druids and Fiddles, oh my! I love this post. What a cool concept, raw milk vendor Location envy. Thank you! The raw milk vending machine is one of the best parts of living where I do.